i told you in the msn *me dejaste con la boca abierta*, i love it, it goes to my computer as favorite! The bg looks great PLUS I like your vector. The glowing sword looks really cool and the scy looks good too. Ok,i dont know where do i start about the vector,maybe i will write u in your guestbook in spanish ^^. Well,talking about the background,you need to round the moon,cause just look like a circle pasted in the background,also u can blend better the black grass with the green ^^. Overall is nice work,very nice scene. wow, it is awesome, i like it so much! nice effects and the bg " ni que se diga"
Wow, this is the first time I've seen a kenshin wall I wanted to fav! Great job. Ok well this is a really nice wall. The sky looks really good with the clouds and all. Love the bird on the branch, it's a nice touch. The grass seem a bit unreal though, it's too much flashy green for the luminosity of the wall. And for the vector, it's great, I especially like the glowing sword. But if you look at the face and the hands the line are not pretty smooth like the should be. it's super clean and you've done a brilliant job with it! Hey thats a real nice lookin wall. I've haven't seen the show yet. Both the character and the bg go together real well. His dangerous look blends with the bg and sets the mood. Very nice job. Gets a fav for sure! I'll never get tired of seeing sammuris wielding their swords on an anime wallpaper. Great Wallpaper! Colors, background and Kenshin are match perfectly. A really good design. hmz...the tree branch with the little crow on the foreground looks too flat....a sillhouette....try to get the perpective in it =) the sky looks nice, nice job and keep the works ^_^~! Oh,a new beautiful wall from Cynthia.I love it girl.You did a great wor.Love the night sky background,and the ravens(or crows) just blend in together. This is good! I'm a huge fan of Rurouni Kenshin and I must say that this is a great wallpaper. *9.45 and Grade AA* for a nice looking wallie. nice wall KittyCyn, I like the nice dark colors you chose, it matches the scan and the bg very well and gives a nice somber mood. 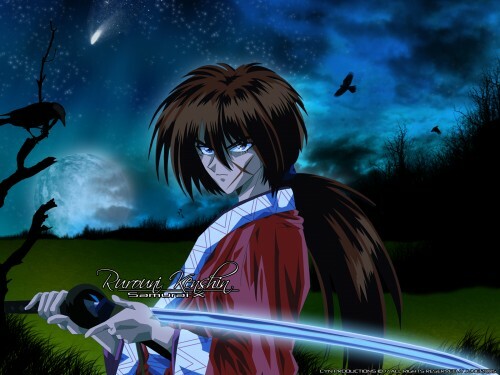 Rurouni Kenshin is a excellent anime, this wallpaper is a good job, the background is ok, thank you for sharing it.!! !